Do you know the song titled “Could it be love” by Raisa or “Keep Being You” by Isyana? Which one do you prefer? Those songs are hits songs in Indonesia, knowing also that the singers sing their songs so great and beautiful. However, not only the songs that makes us hypnotized but also the singers. They are Raisa Andriana and Isyana Sarasvati. Also, it becomes the hot topic that those two girls are similar. I as Indonesian people who is not really support Indonesian music by listening to Indonesian’s songs have an exception for those girls. I do not put any Indonesian’s songs on my playlist except for the song that are sung by those girl. The songs are “Could It Be Love” and “Keep Being You”.They sing like foreign people and the music is also easy-listened. However, today I like to keep listening to Isyana’s song since the song is new, more western and have a simple music. Because they are top singers in Indonesia, it will be great to compare them knowing that they both are beautiful, talented and famous. For Men, maybe it was the hardest thing to choose one of them, but for girl it was easy to choose someone with the same gender. Me as a girl admits that they have beautiful faces and hair. Their hair are beautiful with long and curly in the edge of the hair. As we can see, their faces also similar. 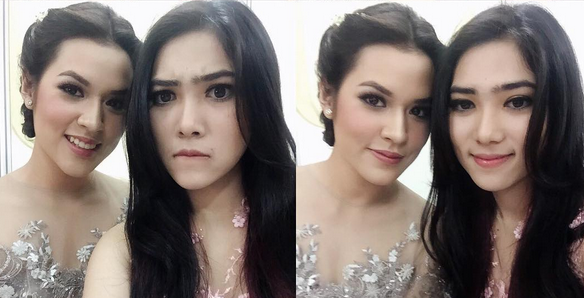 Raisa’s face is so perfect with her smoky eyes make up and Isyana is so cute with her natural make up. However, personally I like someone who is natural, and I think Isyana is more natural. Besides of their beautiful faces, they both are talented. We all know that Raisa’s voice is sweet and easy-listened and really fit to jazz music while Isyana’s voice is like a high-class voice because we as listeners feel elegant when hear her voice. She really fits to classical music. Moreover, she usually performs using her organ or piano which makes her unique and special. Talking about a music industry in Indonesia. A talented girls like Raisa and Isyana are in the top of other singers and bands’ row. Those girls can make their songs become hit and acceptable for everyone not only for Indonesian people but also for foreign people. They also always show in Indonesia various TV channels. They can sing in English with perfect pronunciation. However, since Raisa’s debut is earlier than Isyana, she has many songs and can held a concert for herself. Therefore, it is not possible for Isyana to be as Raisa in the career context. Furthermore, I’m sure that she will produce great songs that can bring her go international. As a conclusion, they both are beautiful and talented. They also famous, although Raisa is more famous than Isyana, I believe that Isyana can be very successful in her carrer. Personally, I like Isyana more than Raisa. It’s my opinion, your opinion? It’s up to you guys because everyone has their own perspectives.